mickey | Randomwhoness: a Doctor Who blog by Johnny Spandrell. Sampling stories in random order. In much the same way that 21st century Doctor Who used to have celebrity historicals, it also used to have “bottle shows”. As Russell T Davies explained in The Shooting Scripts, the bottle show is the cheap episode in a season. One of the side effects of having fewer episodes per season is that the budget seems better spread across each episode. If there’s a bottle show in series 9 and 10, it’s not immediately apparent. Certainly not in the way that it’s apparent in Boom Town, the eleventh episode of the first series of Doctor Who’s modern run. Watching it again for the first time in yonks, I was struck by just how low-budget it looks. Davies claims that he wanted to show off Cardiff in this episode, in order to thank the city and its people for hosting the show, but sticking close to home is also the cheapest way to shoot something. Not for Boom Town exotic alien spaceships, CGI monsters or the London blitz brought to life. It’s a drama played out in council offices, restaurants and public squares. On paper, it doesn’t sound like a setting guaranteed to captivate an audience. But Davies spots the opportunity to use those mundane backdrops in a story of interpersonal drama. The Doctor (Christopher Eccleston, pitch perfect) and Blon Fel Fotch Passameer-Day Slitheen, AKA Margaret (Annette Badlands, equally pitch perfect) spend the episode sparring verbally, as the Doctor prepares to pack her off for execution by her own kind. And as Davies has said, with two actors of this calibre, that’s all you need. To save Cardiff from a catastrophic nuclear explosion, the Doctor must return Margaret to her home planet, where she faces fatal retribution. To save herself, Margaret must convince the Doctor to spare her. In its understated way, Boom Town positions the Doctor in a stark new light; for once, he has a prisoner, who is begging him for her life. And despite the fact that Margaret is sly and treacherous throughout – it turns out, she has engineered the whole sitation – her appeals are enough to give the Doctor (and the audience) pause for thought. This episode remains the one which most keenly questions the Doctor’s levels of mercy. The crucial moment in the episode is when Margaret pleads that she’s capable of compassion, arguing that only that afternoon, she refrained from killing a pregnant woman. The Doctor’s response is shrewd but reveals more about him that he intended. DOCTOR: You let one of them go, but that’s nothing new. Every now and then, a little victim’s spared because she smiled, because he’s got freckles, because they begged. And that’s how you live with yourself. That’s how you slaughter millions. Because once in a while, on a whim, if the wind’s in the right direction, you happen to be kind. MARGARET: Only a killer would know that. The point Margaret makes is telling because she’s not relying on the mercy of a pure heart. The mercy of a killer is surely harder to secure than that of a simpler hero. Earlier in this same season, we saw the Doctor coldly watch as Cassandra was ripped apart, making no effort to save her, passing judgement on her for her crimes. So we know he’s prepared to draw a distinction between good and bad, and he won’t shy away from capital punishment, as long as he’s given the villain a chance to give up the game. For a person who is such a defender of life, he’s prepared to take other lives in that defence. That’s an inherent contradiction in the Doctor that long term viewers are familiar with. The question that Boom Town poses is, will the Doctor relent and show Margaret the mercy he didn’t show Cassandra? While all this is going on, Rose (Billie Piper) is also on an awkward date. She’s summoned Mickey (Noel Clarke) to Cardiff to bring her passport, but it’s a ruse; she just wants to see him again. So they head off into the night to paint the town Welsh red. Not that I’ve ever been to Cardiff, so I shouldn’t really slag it off, but I notice this doesn’t take long and so they end up aimlessly wandering the streets, presumably looking for an open kebab van. During all the time they spend eluding Cardiff’s nightlife, they recap on the state of their relationship. Initially, it looks like they might sneak away for a dirty overnighter, which would have been an unexpected innovation for the new series (they should watch out, though. We know what happens Doctor Who characters who sneak off for a quick shag.) But then it transpires that Mickey has hooked up with another girl next door and Rose isn’t at all pleased. There’s a surprising amount of screen time devoted to these scenes; much more than would be given over to similar domestic drama these days. I mean, Amy Pond lost her baby in fewer scenes than this. But we never get to a resolution because soon enough the city is being torn asunder and Rose is racing back to the Doctor’s side. Mickey presumably has to go find a hotel on his own, which will be much less fun. On the face of it, there’s not much linking the Rose/Mickey story and the Doctor/Margaret story. But if there is, perhaps it’s this: the whiff of sexism. It’s the women who are the instigators of trouble here. Rose and Margaret are the schemers, manipulating the men around them, hoping to have their cakes and eat them too. Neither of them get to do so, of course, but still, the impression is that the women are the ones playing the men. We never get to find out if the Doctor would spare Margaret’s life. Without warning or explanation, a panel of the TARDIS console flips open and a white light turns her into an egg. She gets to live her life again, a second chance that Rose wants too; another admission that it’s the women of this piece who have sins to atone for. But more to the point, the Doctor is spared facing the moral dilemma he’s been contemplating all episode. Like the much promised big explosion which never actually happens, so the question of how much mercy the Doctor has never gets answered. The boom fails to go off in Boom Town. Twice. 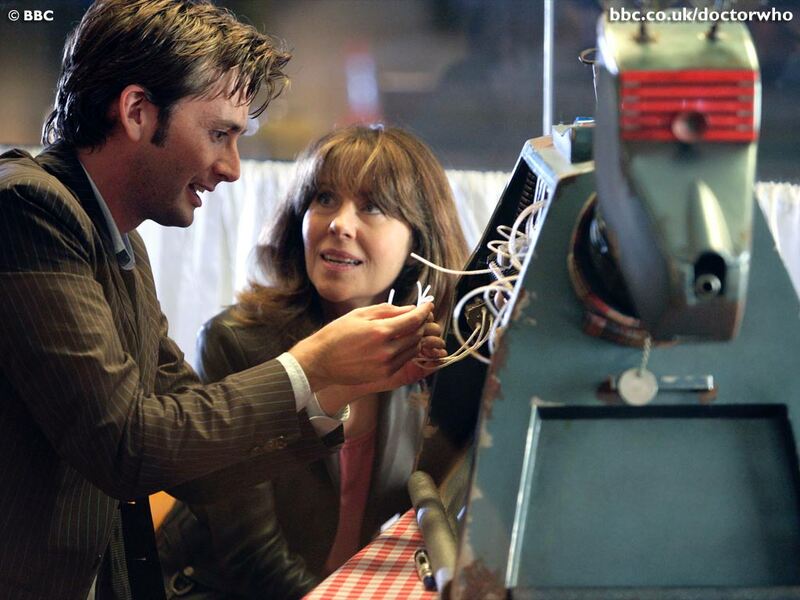 Still, worst off in this episode is Jack (John Barrowman), who spends most of it in the TARDIS fiddling with wires. If only he’d known his future Torchwood self was outside somewhere in Cardiff, standing precariously on buildings or wiping people’s memories, he could have found and hooked up with himself. Taken poor Mickey’s empty hotel room for a bit. You know he would have. Hopefully, he would have bought himself a drink first. If he could find somewhere open in Cardiff, of course. LINK TO Smile: In both, the Doctor sits down for a meal. NEXT TIME: I never will be able to find the words. But I’ll give it a shot anyway with World Enough and Time/The Doctor Falls. In Doctor Who’s olden days, we had cliffhangers. We get them occasionally in New Who as well, but these days we’re more likely to get throw forwards, otherwise known as trailers. How much a throw forward is part of an episode is debatable; sometimes they add little to an otherwise just completed episode. But sometimes they bring something new and interesting to its dying seconds. Army of Ghosts has a great cliffhanger and an intriguing throw forward. First though, let me witter on about how it gets to those, because this is a smartly structured episode. Writer Russell T Davies has no time to waste, so this week’s alien incursion is already well underway by the time the Doctor (David Tennant, at the end of year one) and Rose (Billie Piper, about to wave the show goodbye) arrive to visit Jackie (Camille Coduri, hooray). They learn about the infestation of ghosts and the Doctor sets about disproving it in a typical “I’m having none of that superstitious nonsense” kind of way. The quest leads them to Torchwood, much hinted at during this season and about which we’ve been learning about throughout the episode. With the Doctor and Torchwood plot strands combined, Davies splits his story again almost immediately: the Doctor and Jackie discover Torchwood and its role in generating the ghosts, while Rose finds the mysterious sphere and former squeeze Mickey (Noel Clarke). So the stage is set for a two-pronged episode ending. Meanwhile, Davies has been indulging in a little misdirection. The Doctor assumes that the Sphere is the work of the Cybermen, and Mickey guesses that it contains a big bad Cyber-daddy. The episode is approaching its end when the Cyberleader says they know nothing about the sphere, confounding (hopefully) audience expectations. We end on a double cliffhanger: the Doctor confronted with the prospect of millions of Cybermen around the world, and Rose trapped when a posse of Daleks emerge from the sphere. Fangasms worldwide. Now for the throw forward, and specifically, its last seconds. Over shots of the Cyberleader, a Dalek and a worried looking Rose and Mickey, we hear a Cyberman saying: “Cybermen plus Daleks. Together we could upgrade the universe”. A tantalising ending, which raises the prospect of something new and nerdy; a match-up between the series two biggest baddies. Again, its misdirection. No such alliance is forged in Doomsday. One is proposed by the Cybermen and brutally rejected by the Daleks. And of course, when you think about it, that makes sense. As Davies has pointed out, the Daleks are cosmos-conquering, time travelling geniuses. Cybermen are us with bits added. The former has no need for the latter. But it also reminds us that Cybermen and Daleks are not the same; their technologies might be compatible, but they themselves are not. Davies emphasises that Cybermen are emotionless and Daleks are anything but. They are boastful, quick to anger, goading and they scream inside their bonded polycarbide armour. They can even be tricked into revealing their names by appealing to their pride. Sometimes, even in Doctor Who itself, the Daleks are portrayed as emotionless, rational robots, incapable of imagination and inventiveness. But that’s the Cybermen. Daleks are creatures of pure emotion, specifically hate. Interestingly, although Doctor Who generally avoids monster match ups (unlike say the 1960s Batman series, which, when ratings were failing, would wheel out a double bill of the Joker and the Penguin, for instance. Zonk!) it often puts supplementary monsters alongside the Daleks to indicate what they are not. They are not, for example, the Robomen, who are brainless slaves. They’re not the Slyther or Varga plants which are simple unthinking beasts. They’re not muscly grunt like the Ogrons or aestheic show ponies like the Movellans. And they’re not Davros, who can hold a (admittedly megalomaniacal) conversation. So the Daleks are the main game. They outsmart and outgun everybody in order to get their Genesis Ark primed and ready to spew forth millions of themselves in the skies above London. But the Doctor has a trick up his sleeve. He’s worked out that because the Daleks and Cybermen are covered in voidstuff, he can open the breach and they’ll be sucked into it. Davies can sometimes be accused of employing a quick, convenient solution to his stories; I call it the magic switch. For a classic example, consider New Earth; a cocktail of medicines spreads itself amongst the infected experimentees. Game over, nice and easy. And hey, who can blame him? He’s only got 45 mins an episode, he doesn’t have time to muck around. An ending, albeit one achieved by throwing a magic switch, is still an ending. But Doomsday does it better. Here the fictional explanation about the voidstuff makes a kind of sense, and is signposted early enough in the episode to make it seem less of an arbitrary quick fix, rolled out as time ticks away. The Doctor’s plan takes time to set up as well; it’s no instant cure all and that also helps sell it to the audience. And it’s not perfect – opening the breach puts the Doctor and Rose at risk too – so it’s hardly convenient. In story terms, it’s no less a magic switch than any other pulled in the series’ long history, but it’s sold to us better. And so an epic story comes to and end. 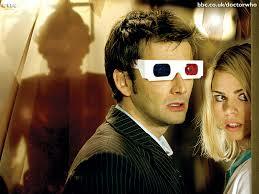 Daleks and Cybermen thrown into hell, and the Doctor and Rose separated by the walls of parallel universes. And just at the end, we get a surprise; there’s suddenly a bride in control room. Cue the first of our “what? What? What? !” moments. The cliffhanger lives to fight another day. LINKS to Pyramids of Mars: Torchwood has an Egyptian sarcophagus in it’s collection of stolen alien goods. Surely a hat tip? NEXT TIME… A space helmet for a cow? It’s back to the Hartnell era for The Time Meddler.